Recently I drove south from Istanbul to Bodrum with some visitors from America. It’s a long trip and being in no particular hurry, we decided to break the journey with a stopover in the town of Manisa. It was a flying visit, so I can’t say we really availed ourselves of all the town has to offer, but we did stock up on a selection of sweets flavoured with the town’s most famous product – mesir paste (mesir macunu). Like everywhere else in Turkey, Manisa has a rich history in which many empires and principalities, civilisations, religions and races have played their part over hundreds and thousands of years. The name itself is a corruption of Magnesia, the Greek name for their city on the slopes of Mt Sipylus. We had a quick look around the town museum, which was a bit disappointing. There were the usual fragments of columns, statuary and gravestones of varying ages. One carried an inscription in Hebrew that Margie later translated for us. I knew there had been a Jewish community in the ancient city of Sardis, a little inland, so it wasn’t a big surprise. Another one was, though. I’m convinced it depicts a couple of space aliens. I can’t give more information on that so I’m including a photo here in case anyone can enlighten us on when they dropped by and how long they stayed. The most picturesque part of Manisa is the Çaybaşı stream that flows from the mountain through the centre of town down a deep gully lined with venerable plane trees. 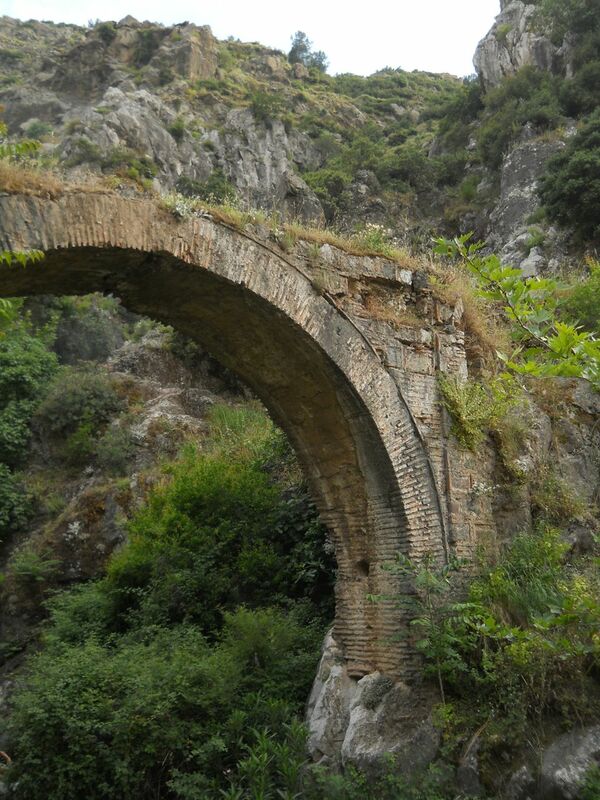 We strolled up the road along its bank to another of Manisa’s attractions, the crying rock of Niobe. According to legend, Niobe, queen of Thebes in Boetia, was blessed with seven sons and seven daughters. Like any proud mother, she couldn’t help boasting about her children – but pride cometh before a fall, as the saying goes. In her maternal enthusiasm, the fertile Niobe apparently mocked a woman by the name of Leto who had only two children. Unfortunately for Niobe, Leto was the daughter of Titans and those two kids happened to be the immortal Apollo and Artemis. Predictably, Leto’s divine offspring wreaked a terrible vengeance on Niobe for the insult to their mother – transfixing all fourteen of her children with arrows; Apollo the boys and Artemis the girls. 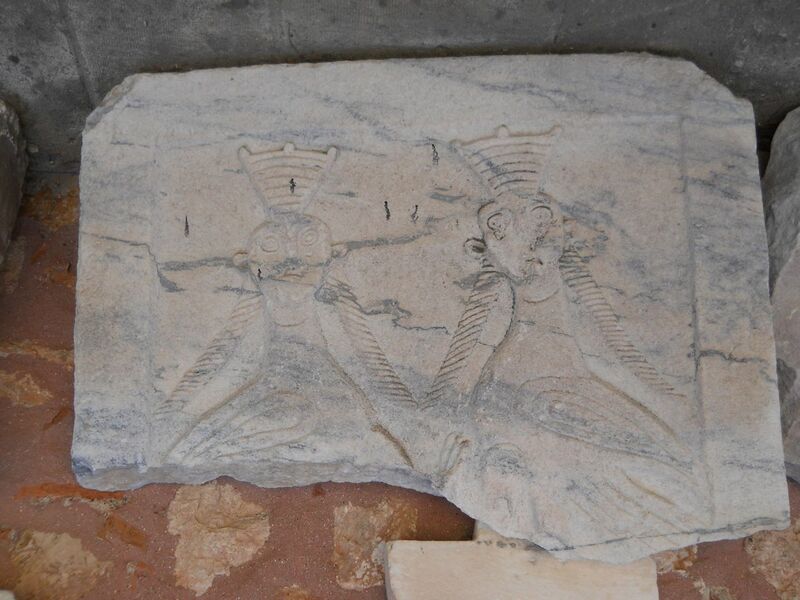 Their father, Amphion, either committed suicide or was also murdered with a fifteenth dart, the story is unclear. As for the distraught mother, she fled to Mt Sipylon where she was turned to stone, and her never ceasing tears form the stream whose course we had been following. Warmed by our climb we were happy to find a leafy tea-garden nearby where we were served ice cream and Turkish coffee. The mountain rose above us and a small waterfall cascaded into a pool into which local lads were diving – a scene which could well have been in New Zealand, except for the remains of an ancient bridge, Kırmızı Köprü, framing the tableau. But I am aware that some of you visited this page because of the word ‘Viagra’ in the title, so I will keep you in suspense no longer. I had been enjoying a small square of mesir-flavoured Turkish Delight each day for a month after getting back to Istanbul – so I can personally vouch for much of what follows. Our newspaper the other day informed us that a new product has been added to the mesir menu: the traditional Turkish sherbet drink is now available in a form modified to deliver the benefits listed below. ‘Sultan Selim I, known in English as Selim the Grim, came to Manisa with his wife, the Sultana Hafsa, while on a journey in the year 1539. The Sultana had been ill for some time and many doctors had been trying to cure her, without success. 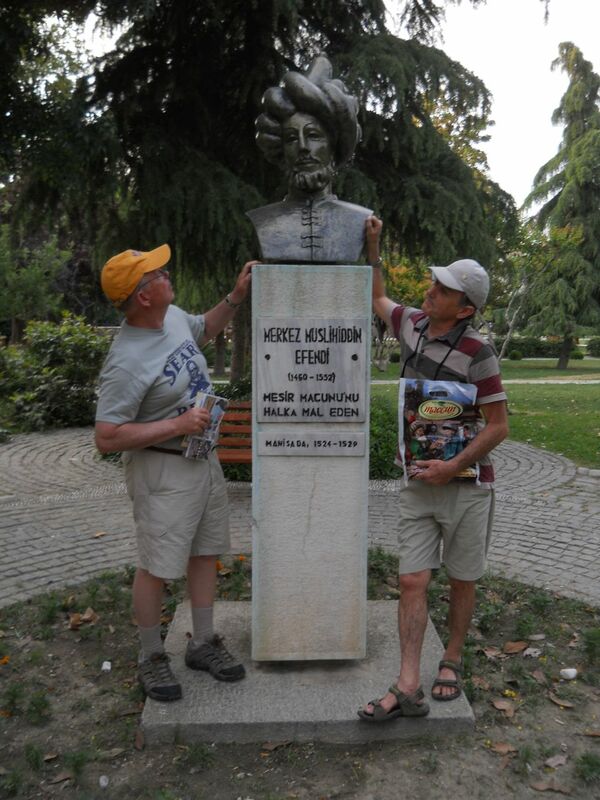 ‘Eventually word reached Merkez Muslihiddin Efendi, chief teacher and doctor at the medical centre in Manisa. Merkez Efendi spoke with Sultana Hafsa and examined her, then made a list of herbs and spices and gave it to an orderly. He prepared a paste with measured amounts of the ingredients, sweetening it with sugar. After eating the mixture, the Lady Hafsa made a complete recovery. ‘Noticing that she was now even healthier and more spritely than before, the Sultana commanded Merkez Efendi: ‘Let’s make a large quantity of this potion and give it to our people so that all can benefit from this amazing panacea.’ Large cauldrons were set up forthwith, ovens were heated and tons of mesir paste were prepared. As news of the preparations spread, all the people gathered in front of the Sultan’s Mosque. Seeing that it would be difficult to feed the people one by one, the officers started to distribute the mixture wrapped in small pieces of paper. The whole country heard that this event took place on Nevroz Day and afterwards greater amounts of mesir paste were prepared in larger pots and doled out to ever increasing crowds. The Sultan arranged for the potion to be delivered to aged and infirm people who couldn’t come to the square so that they too could reap the benefits. ‘It strengthens the body, invigorates the heart, soothes the nerves and improves memory and brainpower. Anyone who eats it will be protected for a year from the bite of poisonous creatures. If you eat mesir paste on Nevroz Day it will alleviate even the worst diseases. It is believed that girls of marriageable age who eat mesir paste will marry within the year, and that childless couples eating this miraculous concoction will have children before long. Well, you probably don’t need it, and maybe you don’t believe the story anyway – but I have a sneaking feeling the recipe may have some connection to those space aliens. Postscript – A reader has pointed out to me that Sultan Selim I actually died in 1520, so it is unlikely that he was in Manisa or anywhere else on Earth in bodily form in 1539. Thanks Kaan! In my defense, I was only translating someone else’s document, but still I should have noticed that error. Not sure what that does for the credibility of mesir paste – but as with most of these kinds of things, the benefits are probably largely psychological. Traditional Iranian New Year, celebrated by Kurdish people and Alevis in Turkey on the Spring Solstice, 21 March. This entry was posted in Ottoman Empire, treasures of Turkey, Turkish culture and tagged history and culture, Turkey. Bookmark the permalink. Nice blog, Alan, and a reminder of our lovely visit. Our flight to Bodrum was not anywhere near so interesting. Thanks for the translation shout out. It’s always nice to be able to access early learning and apply to a contemporary situation. I think the brochure needs to be modified to include an additional benefit: if you have any dental work that you would like to undo, chewing on mesir candy will do the trick!